Your life is not meant to be spent chasing a new you, despite what the big marketing campaigns are telling you. When you choose to live from the inside out, your life becomes about being your best you. When you design life and business from the inside out, you create a rewarding and meaningful life. When you choose to live from the inside out, your life becomes about being your best you. What does your heart desire for the new year? I love this quote from Paulo Coelho’s The Alchemist, a book I’ve read every year between Christmas and New Years for the past decade. Every year its message to me changes based on where I am in my life’s journey. What’s in your heart for the new year? If it’s true you can’t escape it, isn’t it best to do as The Alchemist says and embrace it? Intentions are not resolutions or goals. The most effective resolutions and goals are derived from an intention. Intention, intuition and your heart’s desire are all intertwined. They are felt in the depth of your gut. They are guideposts for your life. 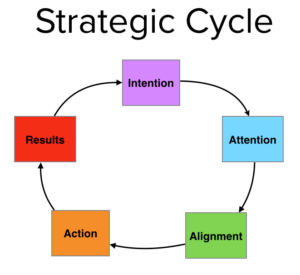 In my “Design Your 2017 Strategy Online Workshop”, I use a simple graphic to show where intention fits into a cycle of creation I call the Strategic Cycle. Intention is the beginning and ending of every creation cycle. Like gravity, your intention is present whether you’re aware of it or not. Create with conscious intention and you have a roadmap to guide your more concrete actions. Most people create by default leaving them at the whim of external forces, circumstances and their own limiting patterns of belief. Do you create by default? Do You Create with Intent, or by Default? How many people do you know who keep themselves so busy they become disconnected from who they really are and the healing they need to do? Maybe even you? If you live in a constant state of being externally controlled, you will become overly sensitive, desensitized, or both. The oversensitive become the world’s pincushion, twitching and reacting every time something “happens to them”. The desensitized numb themselves with busy-ness and distraction. Nothing penetrates their armour as they keep powering through everything and everyone. It’s no wonder there is so much strife and striving. You can turn this around. You can have a positive impact on your own life and on others. When you choose to live with conscious intent, everything starts from inside you. Where you take direction – the inside or the outside – is up to you. You can choose to be internally directed – to live from the inside out. 1 – The goal of the self-directed is to have sovereignty over your own life. It starts with connecting with intent, knowing your own mind, and tuning in to your intuition. Think of another type of sovereign being – a king or queen. They don’t wait to find out what everyone else thinks before they make a decision or take action. 2 – Clarity is paramount. Get clear on who you want to become. Your desired outcomes will be easier to define and your sense of purpose will be stronger. 3 – Understand what it means to be “in alignment”. The way you do one thing is the way you do all things. To see your desires come to fruition, you must define your vision and stay in alignment with it. Regardless of what other people, outside force or circumstance try to dictate on your behalf. Sometimes described as “living from the outcome” to stay in alignment is to remain authentic to your chosen direction. 4 – Have the courage to look in the mirror. Your results, environment and relationship are constantly providing feedback. When things aren’t to your liking, be brave enough to accept your share of responsibility. You’re simultaneously creating and responding to everything in your life. Allow yourself to see when or where you’re responsible for your part of the situation. You can choose to adjust or stay the course. Are you ready to live from the Inside Out? When you layer year over year with conscious intention, the cumulative results are exponential. Nothing gets thrown by the wayside only to be served up again as next year’s “resolution”. Previous Post: « Will ‘Enlighten Us’ Bring the Light?